Rogue’s Loadable Dumbbells condense the key design and manufacturing elements of our full-size Ohio Bar into a compact, versatile new format. As an alternative to storing a complete set of traditional dumbbells in your gym, the DB-10 and DB-15 Dumbbell offer loadable sleeve lengths of 3.625” and 6.75” respectively—enabling athletes to make precision, custom weight adjustments in their dumbbell training using any standard Olympic plates as the increments. As an Additional Option - We have also developed a new type of cylindrical 230MM diameter plate—the Rogue Dumbbell Bumper—manufactured specifically for use with the Loadable Dumbbell. You can learn more about these plates or order a set here. Please Note: Using a set of collars is highly advised for securing the weight onto the dumbbell. We recommend a set of Rogue OSO Collars, which can be added via the dropdown menu on this page. Using the same plates you’d load on a standard barbell, the DB-10 and DB-15 allow athletes to easily adjust the total weight of the dumbbell as they go through different movements and/or when they ramp up their training. This also makes the Rogue Loadable Dumbbell uniquely optimized for a larger gym, where multiple athletes need to be able to quickly customize the dumbbell to their own needs. One tool. All-purpose. The knurled handle carries over the same original pattern we developed for the Rogue Ohio Bar. Months of testing and fine-tuning went into precision-machining a firm but non-abrasive knurl that could maximize both performance and comfort. Please Note: The knurl pattern is the same on all versions of the Loadable Dumbbell. However, because the stainless steel option holds up without plating, the knurl will more accurately maintain its originally designed feel. Manufactured in Columbus, Ohio, the DB-10 and DB-15 really are built like miniaturized Rogue barbells, starting with a 28.5MM diameter, 190,000 PSI tensile strength steel shaft. The sleeves are machined from a single piece with a bright zinc finish, and both versions include quality bronze bushings and a snap ring sleeve design just like our Ohio Bars. 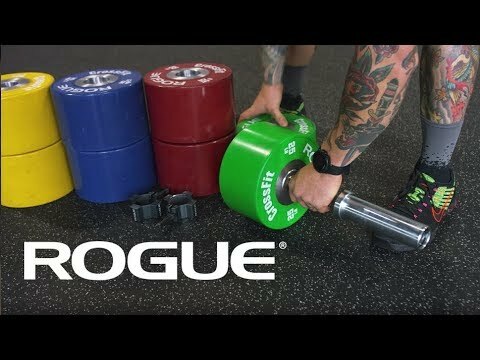 While the DB-10 and DB-15 are compatible with any standard-size Olympic plates, we’ve also designed a unique new cylinder-style bumper—the Rogue Dumbbell Bumper—created specifically for use with this product. At a universal diameter of 230MM, these compact plates create more of a centralized distribution of weight, resulting in a look and feel more like a traditional dumbbell. Rogue Dumbbell Bumpers can be purchased separately from their own product page. Customers can also add a set of exclusive Rogue OSO Collars to their order at an additional cost. These distinctive, American-made barbell collars are manufactured from aircraft-grade aluminum with a rubberized interior lining to protect the dumbbell during use. Available in grey with Rogue branding in white. Rogue prides itself on fast, professional shipping, often with same-day turnaround times. Your dumbbell(s) will be packaged safely and ship fast, and you can follow the progress of your order online using the Rogue Shipping Tracker. Rogue Loadable Dumbbells is rated 4.8 out of 5 by 36. Rated 5 out of 5 by Sjs62 from Superior product Purchased these a few weeks ago. Couldn't be happier with these dumbbell handles. You can feel the difference in the quality of these compared to others the moment you grab hold of them. The knurling feels great, the spin is phenomenal and they just look amazing. These dumbbell handles were built to last!! Rated 5 out of 5 by BB in Seattle from Excellent craftsmanship I bought these recently for my home gym and they work great. Easy to load/unload, rotates flawlessly, craftsmanship couldn't be better. Great product! Rated 5 out of 5 by MYandDAF from Rogue Loadable Dumbbells - Great Bar Great option to have on home gym. Solid and looks great. Rated 4 out of 5 by DaveH123 from Love the loadable dumbbells I bought these a few weeks ago and use them throughout a lot of different movements. Very versatile and allows me to work in new movements without having to have a bunch of different regular dumbbells. The only thing I hope to see is that they start to make loadable plates above 10lbs because it's hard to load more than 2 or 3 plates a side. Rated 5 out of 5 by Goodge from Magnificent dumbbell handle I have hunted high and low for a good quality dumbbell handle. Fantastic. Just a shame It cost me $200 to get them to Australia. Can only hope the bumper plates get shipped in a container by Rogue. If you need an Olympic size dumbbell handle don’t buy a cheap one. Get these. You will not regret it.